Departement of Vaucluse - Pop. : 3,500 h.
12 km north of Orange via the N7, 7 km south of Bollène via the D26. Mondragon is located between Bollène and Orange. The village extends along the Grès hill, and also onto the opposite bank of the Mondragon river, next to the motorway. Strolling around Mondragon, you will discover thateven today there are still the remains of its medieval ramparts within the village. 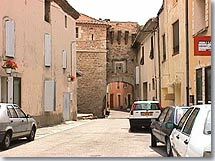 the Rue du Moulin, you will see a crenellated gate bearing the town's coat of arms, suggesting the tough, bellicose appearance of its medieval fortress. Although the chateau built upon a rock was badly damaged during the wars of religion, it is still lived in. Its strategic position enabled it to control the Rhône and the valley road. 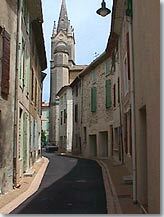 In the centre of the village on Rue Jean Jaures, you'll come across the Romanaseque-style chapel of the Penitents. It is crowned by a bell tower. 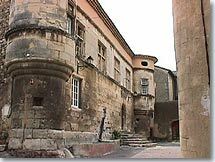 Close by is the Hotel de Suze (14th century) with its elegant Renaissance facade. It belonged to the Count of Suze, lord of Mondragon. 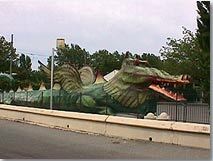 the other side of the village, in the courtyard in front of the mairie, stands an imposing coloured dragon. This carnival-like animal is a reference to the local legend about a dragon. It is said that this legendary beast lived in the cliffs above the village and haunted the banks of the Rhône. The Hotel in Suze (14th century). Remains of the Chateau des Dragonet (12th century). Chapel of ND des Plans and Chapel of Derboux. 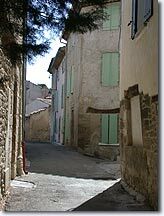 Mornas (5km), Lapalud (8km), Lamotte du Rhône (7km).